Spaghetti with meatless Meatballs served with vegan scallopini & grilled asparagus ; a Meatless Monday Meal!! At the outset I would like to inform you that this post is sponsored by Gardein and is a review of their vegan products. Most days in our home we eat vegetarian meals and enjoy them. On occasion I cook fish or chicken but that’s about it. I do not cook meat. Most people find it difficult to eat a meal that is devoid of meat. Quite often they have a hard time finding a wholesome meal that is vegetarian. Truthfully, most Indian meals are vegetarian and quite wholesome. Growing up, nonvegeterian fare was cooked only on Sundays. However I understand the situation people here in the US find themselves in. That’s why when Gardein approached some Meatless Monday bloggers, I was quite happy to participate in their campaign and promote their vegan fare. Previously I have tried the Seven Grain Crispy Tenders, the Veggie burger, the Ultimate Beefless Burger and the Crispy Chick’n Patty. All of them are quick and easy to prepare items, making them perfect for a weeknight dinner. You can check the review for them here. The kids were in the mood for sphagetti. So this time around I decided to make a weeknight meal using the classic Meatless Meatballs and chick’n scallopini. Making it was easy and everyone polished it off their plates. Cook the scallopini as per the instructions on the package. Cooks within 5 mins. Cook the sphagetti as per the instructions on the package. Heat 1 tbsp oil in a saucepan. Add the diced and crushed garlic. Sauté for 2-3 seconds or until fragrant. Add the pasta sauce and let it come to a gentle boil. Now add the meatballs in and let it simmer as per the directions on the package. When done turn off the flame and keep aside. Heat 1 tbsp oil in a pan. Add the asparagus, salt and pepper. Cover and cook on low for 5 mins. Place a serving of spaghetti in the middle of the plate. Pour a ladle of pasta sauce with 1-3 meatballs on top of the pasta. Serve one slice of scallopini and a serving of asparagus. Serve hot. I will bet that most won’t notice the difference. Gardein products are that good!! Please do share your thoughts. Your opinion matters! Sometimes my children get bored of having rice for dinner on a daily basis and ask for something else.. While they are not much of a pasta fan, I think this particular time, they just felt like pasta and requested for pasta for dinner. I had a lonely pack of Rotelle pasta sitting in my pantry and decided to use it. I was going to make a basic white sauce, throw in some peas and carrots and call it a day. Coincidently, on the back of the pasta package I found the recipe for Rotelle Primavera. Usually I am wary about recipes on the box but this one was vegetarian and had green beans asparagus, green peas and bell peppers. When I looked in my freezer, I found that I had used up my peas and carrots but I had a handful of just peas. In my refrigerator I had fresh green beans and purple asparagus. I didn’t have any peppers on hand. I didn’t have half and half so I used whole milk instead, which also cuts the calories! I decided to try the recipe. I am glad I did. It was quick and easy to make and the taste was delicious! The kids loved it and so did hubby!! I strongly recommend this wholesome pasta recipe, especially now that spring is here and there will be a plethora of fresh vegetables in the market. No, this post has not been sponsored by Ronzoni pasta!! 1 1/2 cupswhole milk or half and half. Prepare pasta according to package directions, adding green beans to pasta cooking water during last 5 minutes. Meanwhile, in large skillet over medium-high heat, melt butter with olive oil; add asparagus. Season with salt. Cook 5 minutes, stirring occasionally, or until vegetable are crisp-tender; reduce heat to medium. Add flour; cook 1 minute, stirring constantly. Add milk and peas. Cook, stirring frequently until mixture thickens slightly. Toss hot cooked pasta and green beans with sauce; serve with Parmesan cheese and freshly ground black pepper. You can use other vegetables that you may have on hand such as broccoli, peas and carrot, cauliflower etc. My favorite way to include quinoa in my diet is by making a salad of some kind or mix it with rice in a Pulao. I usually make quinoa-Black bean salad or make methi pulao. When Camellia sent me a bag of Lima beans, I decided to make Quinoa Pulao without any rice in it using a very simple and basic recipe that doesn’t require too many ingredients or take too much time and yet is simply delicious. The end result was more like a warm salad that is nutritious what with both the main ingredients being protein-rich and quinoa we know is a superfood! Do give this recipe a try. It is naturally gluten free, low fat and great for diabetics. Onion: 1 medium, chopped lengthwise. Heat oil in a kadai/ sauté pan. Add chopped onions and 1/2 tsp salt. Sauté until the onions turn transparent. Add the chopped bell peppers and sauté for 2 minutes. Now add the turmeric powder and the drained lima beans and sauté for 2-4 minutes. Add quinoa. Mix well and sauté for 1-2 minutes or until it all comes together. Garnish with freshly chopped cilantro leaves. Labels: easy, healthy, Lima Beans, Meatless Monday, quick, Slow Food USA, Vegan, vegetarian, weeknight meal. When Camellia Beans reached out to the Meatless Monday Bloggers with their Slow Food USA initiative I was quick to volunteer. inspire individuals and communities to change the world through food that is good, clean and fair for all. initiative encouraging vegetarian meals, Camellia Beans is a family owned and farmed business that has been providing consumers with high quality beans since 1923. Beans is a great source of protein, iron and folic acid. When coupled with a carbohydrate such as rice or bread, it makes for a complete meal. Beans form an integral part of the Indian diet as majority of the Indians are vegetarians. There exists a plethora of recipes in the Indian Cuisine that makes use of beans in some form or the other and is beautifully complimented with particular vegetables. I chose to use Lima Beans to be showcased for this special day today as it happens to be my favorite beans. I have created 3 recipes using them, all of them gluten free, diary free, nut free: Lima Beans Rice, Lima Beans in a curry and Quinoa Lima Beans Pilaf, each one competing with the other in taste and ease of making it. It’s time to come to the table to celebrate Food for Change! Join me in supporting tasty solutions to climate change. On December 10, the global Slow Food network will celebrate Terra Madre Day. In the USA, we are taking to the kitchen to prepare plant-based meals with ingredients grown and produced in climate-friendly ways. I am sharing my food with my neighbors in my apartment building. Whom are you sharing yours with?? By acting together as a global network, we can pivot towards more sustainable food production and farming systems, and achieve a climate friendly future. Food is a cause and victim of climate change, but also a delicious solution. This year, @SlowFoodUSA has focused on the positive solutions of Slow Food to connect the dots between farmers and consumers as the everyday climate champions. Choose climate-friendly foods, try this recipe at home, and tag your dish with #FoodforChange and #MeatlessMonday. 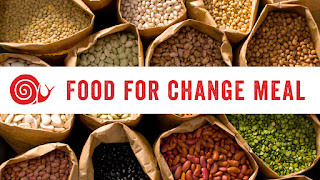 Camellia Beans has generously contributed many pounds of beans for our Food for Change meal participants to use, which you will/have received from Slow Food in anticipation of Dec. 10. Here is a little more about their delicious beans and some vegetarian recipes for inspiration! Our Food for Change meal on December 10 is in support of Meatless Monday (because it’s a Monday!) and isdesigned to inspire our community to reduce their meat consumption. If you are in need of inspiration for plant-based recipes, Meatless Monday has a whole bunch of tasty-looking recipes on their website! Meatless Monday Vegetarian Recipes with BEANS! I am Indian and therefore rice has a ubiquitous presence in my diet. My husband prefers pulao( pilaf), fried rice, Biryani or any kind of one pot rice dish as opposed to plain white rice served with some curry ( side-dish that has gravy). Lima Beans is one of my favorite beans and I decided to make a rice dish using the Lima beans sent by our friends at Camellia Beans. Many of you must have eaten the cilantro lime rice at Chipotle. Imagine that with Lima beans added to it. Believe me when I tell you that not only does it taste delicious but it makes for a complete meal what with the essential elements of protein, carbohydrate, fat and minerals. Do try it. It is quick and easy and you will fall in love with it. You won’t even need a side dish for it! It is a great way to make use of leftover rice!! Add 4 cups of warm/ hot rice to a bowl. Now add all the other ingredients and toss until the rice is thoroughly mixed with the other ingredients. Be gentle while mixing so that the rice does not become mushy! Serve hot with a side of your choice or eat it as is! Labels: beans, easy, healthy, Lima Beans, Meatless Monday, quick, Rice, Slow Food USA, Vegan, vegetarian, weeknight meal. Lima Beans Song (Curried Baby Lima Beans in spicy onion-tomato sauce). At the outset let me confess that this post has been sponsored by Camellia Beans. We Konkanis make several types of songs. Not the musical kind; the gastronomical kind. Song is basically the type of sauce or gravy that is make out of sautéed onions and tomatoes. Loads of onions and tomatoes are used in this dish. Song can be made with coconut ( masolu ghalnu) or without coconut in which case it is referred to as mirsange pitte song ( which essentially means song made with chilli powder). This is a nice tangy , spicy,delicious dish. Like I mentioned earlier there are several types of song: batate song( made with potatoes), mushroom song, tingalavre song ( made with navy beans).It is again one of the favorites in my household. The best part is that it is quick an easy to make! I decided to make this song with my favorite beans: baby Lima Beans. Coriander leaves( cilantro): 4-5 sprigs for garnishing. Soak Lima beans in 2 cups water for Atleast 4-5 hours or overnight. Then drain the water, add fresh water about 1.5 cups and cook in pressure cooker with until tender. Generally about 15 minutes on medium heat or until you hear 1 whistle. Make sure you don't overcook the beans as the dish will turn into a mushy paste.Do not open the pressure cooker until the pressure has completely been released. Keep aside. Heat oil in a frying pan/ wok on medium heat. Add the chopped onions, sauté until they turn almost golden brown. Add the tomatoes and sauté until the tomatoes begin to wilt. Now add turmeric powder and Chilli powder and sauté for 30 seconds. Now add the cooked navy beans( without the water) and mix well. Add the water left behind from cooking the beans as needed based on your desired consistency of the dish. Add salt, mix well. Simmer until it comes to a gentle boil. Turn off the flame. Serve hot with rice/ roti/ bread. Sanna ( Mangalorean Steamed Rice Cakes). Gobhi Manchurian ( Cauliflower Manchurian) made healthy! sushealthyliving.com. Simple theme. Powered by Blogger.